to my card over some Wplus9 Happy Wishes stamped leaves. I stamped my sentiment (from PTI's Wet Paint) in lovely lady and tropical teal. Make It Monday at Papertrey Ink: Faux Brush Lettering. so I went over the whole word with some berry sorbet, water and a paintbrush. Just beautiful Leigh - so bright and cheery! Love this one, Leigh! Gorgeous colours and layering of the flowers over the stamped leaves (they add that special touch). And of course you did a fabulous job with the faux brush lettering! Very pretty! Love the bright & cheery design! Okay this is so sweet Leigh and you are very brave to test out that technique and then to back in with another colours--well done! Thank you for sharing with us at Muse this week! This is gorgeous, Leigh! I love those PTI flowers and those fun leaves. Your bright coloured sentiment is perfect too! Ooooh! I couldn't look at this card without getting a big smile on my face! Such pretty colors and flowers! Fabulous card Leigh! Love the watercolored sentiment! Fun card with the pops of bright colors! Beautiful card, I love these flowers and the sentiment looks perfect. Perfect pink to catch the eye. Beautiful..... love every perfect detail! Gorgeous Leigh! Love the cluster of bright, happy flowers and your watercoloured sentiment. Oh, it's beautiful! Absolutely love the floral cluster, and love the dimensional layering you did with the dies! Really gorgeous look on the sentiment, too! What a fun technique! LOVELY!!! SO sad I missed this one!!!! FAB Leigh! Fabulous rainbow of floral colour, and a great job with the MIM technique! The leafy image from the WPlus9 set pairs beautifully with the PTI flower images/dies too. Such a beautiful and "happy" card! It's so perfect for this week's challenge at Muse. I absolutely love this card,its so bright and cheerful! Beautiful bouquet & I love how you did the sentiment, Leigh! This is gorgeous love your mix of colours and the sentiment just fits perfectly. So gorgeous, Leigh! 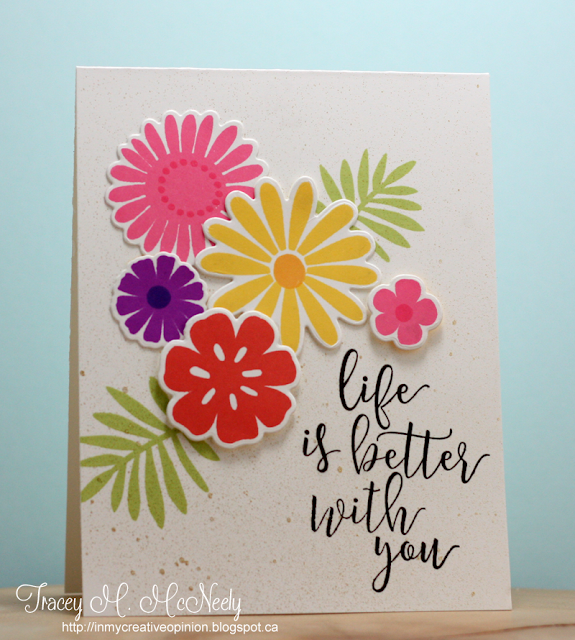 That bright bouquet is fabulous, and I love how your brush lettering turned out!